THE CROWD GOES WILD! A smooth bass line of roasted notes establishes the deep end beneath arpeggios of complex chocolate malt, while power chords of caramelized grain open up to an extended malty jam. Black barley teases treacle character and wades into a velvety sea of oak-derived vanilla and toasted coconut tones. Sustained improvisation of fruitiness modulates to an intense finale, and encores with a rich, espresso-roasted reprise, a capella. 22oz bottle bottled on 11/18/14. Yes, I've cellared this beer (cellar temps, horizontally) for over 4 years. There are definitely some signs of sedimentation on the down side; hopefully that doesn't do too much harm. Served in a curved stout glass. Black and oily, with a very little amount of brown head. Aroma is big and boozy, with bourbon, or maybe rum soaked raisins. The first sip is incredible: milky in texture, but molasses and treacle in flavor, with a huge vanilla oak character. In the finish, the sour side of the bourbon comes out and the corners of my cheeks pucker a little bit. The boozy raisin and fig flavor is what dominates here, besides the bourbon of course. This is not a chocolatey or coffee-ish imperial stout. This a bourbon barrel aged stout to end all bourbon barrel aged stouts. I'm not sure what kind of bourbon barrels they were using in 2014, but that sour note has been prevalent in YEM, at least since they brought it back (many years ago now). I'm having it just slightly cooled, and it this temperature it is incredibly smooth and flavorful. Carbonation is all but negligible, perhaps it's lost some of what it once had over the years. 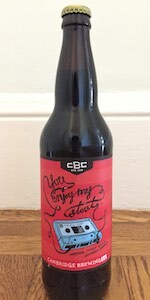 CBC executes my favorite style and produces one of my favorite CBC beers. The cork came out with a big pop and, like others, this poured with big frothy head. Much more carb than expected. Overall, though, the pour is black and looks appealing once carb settles. The nose has some roast but is dominated by a sweet cherry aroma with some wet wood and doesn't quite smell right. Taste starts with a bit of roast and sweetness that gives impression of vanilla, but it goes downhill quickly from there as it turns into a tart fruit. Not quite sour but after taste isn't pleasant. I've never had an infected bottle before and can't be sure that's what I have here, but that's my guess. Aged ~18 months. Pours like a beer-lion out of the bottle: huge head erupts from the bottom of the glass and lifts straight up. Bubbly, puffy and foamy before it sags and craters above the viscous black body. Gorgeous. The aroma is dark chocolate, oak, bourbon, figs, char, vanilla. The barrel characteristics shine. Although there's a fig-like fruitiness it's less pronounced than when fresh. Seems to be the oak and bourbon have filled the gap, which is right up my alley. Velvety smooth and marshmallow soft - the liquid allocates tastes of chocolate, roasted grains, char, oak, vanilla and toasted coconut. Nice alcohol warmth but a far cry from what the ~11% ABV is capable of. Outstanding brew. poured from bottle, couldnt find a date. black with a kahki head that recedes quickly, leaves a few spots of lacing. burbon, roasty malt, chocolate, licorice, light vanilla and toasted wood on the nose. sweet molasses and caramel up front. also getting chocolate and a slightly bitter coffee/espresso flavor. nice touch of the bourbon barrel on the finish. mouthfeel leaves something to be desired, but its not bad. a little much on the carbonation in my opinion, makes it feel kind of watery and light. overall definitely a nice stout but maybe a little much on the caramel sweetness for me. kind of found the overwhelming caramel flavor to be a bit much by the end of the bottle, and i thought the taste became a bit too sour or funky as it warmed, maybe i was just getting sick of it. I dont necessarily think I had a bad bottle, but especially as the beer warmed, the flavor profile I was getting was not nearly as enjoyable as other examples of BA stouts. however it did have some appealing aspects and ill probably try to get another bottle and hang onto it for a while.